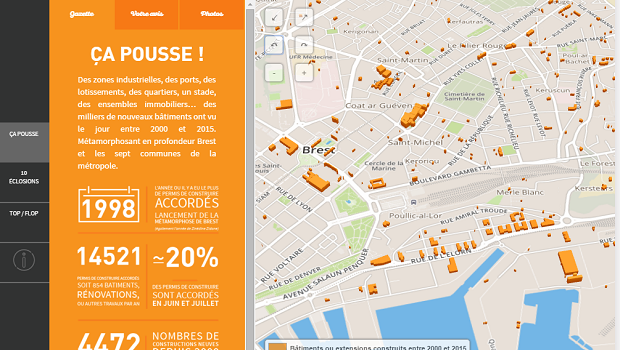 French newspaper Le Télégramme has created Brest (2000-2015) Une Metamorphose En Trois Dimensions (A Transformation in Three Dimensions), a 3D map that illustrates how the city of Brest has grown over the last 15 years. Over this period the city has issued 14,000 building permits, built a tram system, and completed other major construction projects. The map overlays 3D structures of the new buildings on maps of the city and users can add layers illustrating the varying amount of construction between different regions of the city. Le Télégramme’s visualization won first place in Hyblab, a data journalism competition hosted by communication firm Ouest Médialab.